YOQNEAM, Israel, Jan. 4, 2017 /PRNewswire/ -- Neuronix Ltd. announced positive results from its pivotal double-blind, placebo-controlled, multi-center clinical study for the assessment of the safety and efficacy of the neuroAD Therapy System in the treatment of mild to moderate Alzheimer's disease (the "Study"). The results of the Study (the "Results") were presented on December 9, 2016, by Dr. Marwan Noel Sabbagh, M.D., FAAN (Barrow Neurological Institute, Phoenix, AZ), during the late-breaking session of the Clinical Trials in Alzheimer's Disease (CTAD) International Conference. The Study enrolled 131 patients at nine medical centers in the United States and one in Israel. 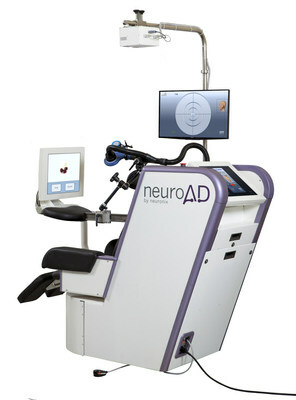 The Study evaluated the safety and efficacy of the neuroAD Therapy System in comparison to placebo, following six weeks of treatment and additional six weeks of follow-up, using the cognitive and behavioral standard scales for the evaluation of patients with Alzheimer's disease – ADAS-Cog and CGI-C, respectively. Statistical analysis was designed prospectively to evaluate the change in ADAS-Cog and CGI-C measures post treatment compared to baseline. Furthermore, the statistical plan also included an evaluation of the interaction between patients' disease stage and the response to the treatment, as well as broad covariate analysis. The Study recruited patients with mild-moderate Alzheimer's disease, either medicated (on stable dose) or non-medicated. The Study Results confirm and extend the results of former studies conducted across the world with the neuroAD Therapy System. Positive efficacy results were reported for patients with milder disease as determined by the Baseline ADAS-Cog. In that group of patients, which represented 85% of the enrolled population, a positive and statistically significant difference of -1.8 points in ADAS-Cog was noted between treatment group and placebo group, at the 12 week follow-up. In the entire Study cohort, including those with more severe disease at baseline based on the ADAS-Cog, results did not reach statistical significance. The CGI-C results in the overall population at week 12 showed a trend toward improvement, with a difference between treatment and placebo groups of -0.4 points. When analyzing the group of milder patients, as defined above, the difference between treatment and placebo groups reached -0.45. Furthermore, when measured on the CGI-C scale, only 16% of treated patients deteriorated, compared with 42% of patients in the sham group. In addition, results showed a favorable safety profile, with no patients experiencing seizures or other persistent, serious adverse events. Patients also showed a high degree of adherence to the treatment, with few discontinuations and a high rate of treatment completion. The Results, together with previous studies' similar outcomes, were used to support a United States Food and Drug Administration (FDA) de-novo application filed by Neuronix in November 2016, seeking regulatory clearance to market the neuroAD Therapy System for treatment of Alzheimer's disease. This submission follows earlier communications with the FDA, as a result of which the neuroAD Therapy System was accepted for review under the Expedited Access Pathway (EAP) program, which is reserved exclusively for medical devices that present novel and breakthrough technologies, and target an unmet medical need which is life threatening or irreversibly debilitating. Alzheimer's disease is considered to be one of the greatest unmet medical needs in the world today, with only a few available drugs offering partial clinical benefit, frequently limited by side effects. The neuroAD Therapy System is a patent-protected, non-invasive medical device, uniquely combining transcranial magnetic stimulation (TMS) with cognitive training, to concurrently target brain regions affected by Alzheimer's disease. The neuroAD Therapy System can be used in conjunction with other treatments, such as drug therapies. "We are proud to present the data coming from our successful pivotal, multi-center Study, which was carried out in some of the most experienced Alzheimer's research centers in the United States," said Eyal Baror, CEO of Neuronix. "I wish to acknowledge all the people who took part in the Study, and in particular – to personally thank the patients and families who volunteered to participate in the Study. It is to them that we dedicate these great results, and for their fellow patients and families, in the U.S. and around the world, that we are doing our utmost to have the neuroAD System approved." "Alzheimer's disease is one of the greatest challenges in the world of medicine today, and as disease modifying agents are still evading us, we must bring symptomatic therapies for our patients, which can alleviate some of the disease symptoms," said Dr. Marwan Sabbagh. "The Study shows that treatment with the neuroAD Therapy System shows very mild and transient side effects, and can be administered without interruption to on-going pharmacological interventions. It was clearly demonstrated that neuroAD has the potential to improve the patients' cognitive capabilities, as well as increase their day-to-day level of activities, especially for a clinically well-defined sub-group at the milder stages. Once it is hopefully cleared by the FDA, neuroAD will become a powerful tool in the battle against Alzheimer's disease – a battle currently fought with too few resources." Neuronix Ltd. Is a privately-held company, with headquarters in Yoqneam, Israel, and with subsidiaries in USA and UK. Neuronix develops, manufactures and markets novel breakthrough medical-device technologies for treatment of Alzheimer's disease. Alzheimer's disease is considered one of the greatest unmet medical needs in the world today, with only a few available drugs offering partial clinical benefit, frequently limited by side effects. It affects more than 5M people in the United States, and estimated over 30M across the world. The neuroAD Therapy System is a patent-protected, non-invasive medical device, uniquely combining transcranial magnetic stimulation (TMS) with cognitive training, to concurrently target brain regions affected by Alzheimer's disease. This dual-stimulation is designed to improve cognitive performance of patients, following an intervention protocol, which lasts for six weeks, five days per week, with one hour-long session per day. The neuroAD™ Therapy System is approved for use in Europe (CE Marked 0482), as well as in other territories. It is commercially available in leading Alzheimer's centers in Europe and Asia. In the United States, the neuroAD™ Therapy System is an experimental device and is not available for sale.